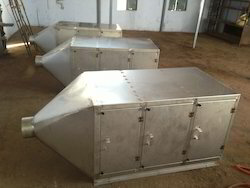 We are engaged in offering Air Filtration Unit to our eminent client. It works with your existing heating and cooling system. Size: 600 x 600 x 300. Size: 600 x 600 x 300. Size: 600 x 600 x 300. Fixing frame for above filters in three stage filtration concept. Flange Type: 10 Micron. Flange Type: 10 Micron. Flange Type: 0.3 Micron. Moc: S.S. 304. Moc: S.S. 304. Moc: S.S. 304. Looking for Air Filtration Unit ?